Five hours after walking away uninjured from a spectacular Helio Castroneves crash in practice for the 99th Running of the 500 Mile Race, Helio Castroneves returned to the 2.5-mile oval in his back-up car. He had to, if possible. “You can’t be scared when you go out there. I didn’t want to wait to run until tomorrow,” the three-time Indianapolis 500 winner said after the session that produced the fastest lap of the month of 230.121 mph by Andretti Autosport’s Carlos Munoz. Castroneves had just turned a lap of 219.183 mph – his first at-speed lap of the scheduled six-hour session – when the No. 3 Shell V-Power Nitro+ Chevrolet spun while running near the bottom of the racetrack in Turn 1 and made left-side contact with the SAFER Barrier. The car became airborne and landed on the airbox before coming to rest on all four wheels. With about 15 minutes left in the session, Castroneves returned to the track and turned another 10 laps with a best speed of 226.670 mph. “I have to thank all the messages from the fans of encouragement, and to Team Penske to put a car together and be back out there again. The car was impressive. Now we can focus on Thursday and Friday,” he said. Qualifications are May 16-17. Castroneves turned what had been the fastest lap of the month of 227.514 mph on May 12. Team owner Roger Penske, who is Castroneves’ race strategist, also thanked the crew. 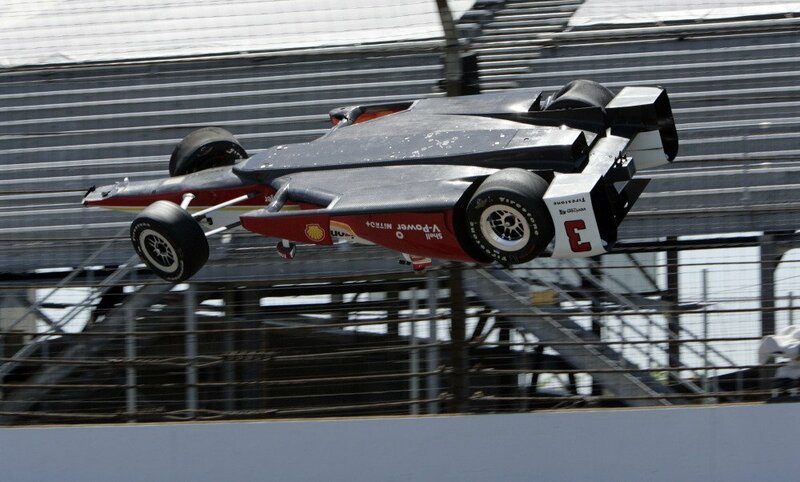 Penske said the team and INDYCAR will examine in detail the reasons for the car becoming airborne. In conjunction with the aerodynamic bodywork packages by Chevrolet and Honda, INDYCAR mandated triangular holes in the undertray of the car to reduce surface area and curb the incidence of a car becoming airborne. “We’re playing with new areas from the aerodynamic standpoint and, of course, going backwards at that speed, you don’t know what kind of lift it had,” Penske said. “You’re always concerned when a car gets backwards; it looks a little bit like NASCAR the way the thing went up and went over. It was the first incident of the month after more than 3,100 laps were recorded. Four hours later, the No. 63 Dale Coyne Racing Honda driven by Pippa Mann spun in Turn 4 and — under braking — made rear-end contact with the inside retaining wall. The nose of the car then made contact with the attenuator at the entrance of pit lane. Mann was examined at the IU Health Emergency Medical Center and cleared to drive. “We dialed in on the set-up and I was getting more comfortable and gaining speed,” Mann said. “We were getting some great traffic runs in, and then it unfortunately went wrong as I caught the big pack heading into Turn 4. The cars in front of me checked up so dramatically that coming fully off-throttle didn’t take enough speed out of the car.